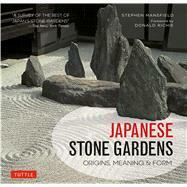 Gain some new ideas along with the principles and history of Japanese stone gardening with this useful and beautiful garden design book. Japanese Stone Gardens provides a comprehensive introduction to the powerful mystique and dynamism of the Japanese stone garden—from their earliest use as props in animistic rituals, to their appropriation by Zen monks and priests to create settings conducive to contemplation and finally to their contemporary uses and meaning. With insightful text and abundant imagery, this book reveals the hidden order of stone gardens and in the process heightens the enthusiast's appreciation of them. The Japanese stone garden is an art form recognized around the globe. These gardens provide tranquil settings where visitors can shed the burdens and stresses of modern existence, satisfy an age-old yearning for solitude and repose, and experience the restorative power of art and nature. For this reason the value of the Japanese stone garden today is arguably even greater than when many of them were created. Fifteen gardens are featured in this book, some well known, such as the famous temple gardens of Kyoto, others less so, among them gardens spread through the south of Honshu Island and the southern islands of Shikoku and Kyushu and in faraway Okinawa. A writer and photo journalist, British-born Stephen Mansfield has lived and worked in, among other places, London, Barcelona, and the south of France. His work has appeared in over 60 magazines, newspapers and journals worldwide, including South China Morning Post, Japan Quarterly, Critical Asian Studies, The Japan Journal, among others. He is also the author of several books, including Japan: Islands of the Floating World, The Insight Pocket Guide to Tokyo and Eyewitness Travel Top 10 Tokyo, China: A Guide to Yunnan Province, Tokyo: A Cultural And Literary History. He currently resides in Japan, where is a regular book reviewer for The Japan Times. Since living in Japan, he has become an authority on Japanese gardens, and has traveled all over Japan to visit and photograph both celebrated and little known gardens. He recently designed and built a Japanese garden at his home in the outer suburbs of Tokyo, a project that took four seasons to complete.